"When God created the horse, he said to the magnificent creature: I have made thee as no other. All the treasures of the earth shall lie between thy eyes. Thou shalt cast thy enemies between thy hooves, but thou shalt carry my friends upon thy back. Thy saddle shall be the seat of prayers to me. And thou fly without any wings, and conquer without any sword. And God took a handful of southerly wind, blew his breath upon it, and created the horse. ~ Bedouin legend" This quote is often used to refer to Arabian horses as the Bedouin are are a part of a predominantly desert-dwelling Arabian ethnic group, however, we feel that this quote applies to any horse because they are all God's creatures. Picasso's great dam sire is none other than the amazing Preferent Friesian stallion Oege 267 who is well known in the Friesian world as the "hair man" for passing along his abundance of hair to his offspring. Picasso's following in his great grandsire's footsteps and is throwing lots of hair to his offspring as well as excellent conformation and amazing temperaments. Picasso's mane is currently 4 1/2 feet long and reaches his knee. 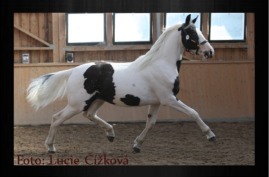 Picasso does not have any Gypsy Vanners in his pedigree. His abundance of hair is from Oege 267. 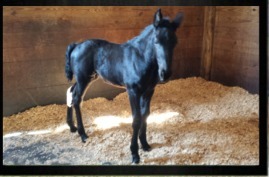 Picasso's Masterpiece was imported from Denmark in 2009 as a foal. 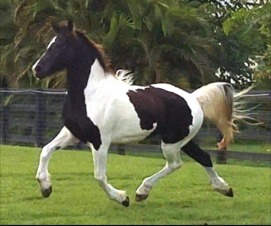 He is registered with ECHA-ESV in Germany and is registered in the United States with the Friesian Heritage Horse as a Foundation Stallion in the Baroque Pinto Warmblood Heritage Studbook , the Friesian Sporthorse™ Association (FSA) in the Main Studbook and in the Bronze Elite Performance Book, and is a Sanctioned Stallion in the Friesian Blood Horse Registry. 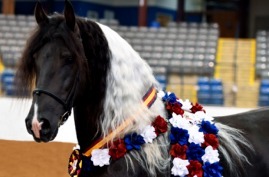 IMPORTANT COPYRIGHT NOTICE: The photos on this website were taken and are owned by Top Hat Friesians & Barock Pintos or used with permission with the photographer's name on the picture. The logos of FHANA, KFPS, ECHA, BPS, USEF, FSA and IFSHA are owned by their respected owners. All web content was written by and is copyrighted by Top Hat Friesians & Barock Pintos. 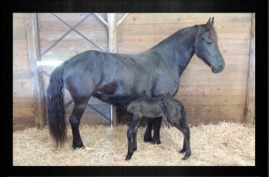 Images and resources from the Top Hat Friesians website may NOT be reproduced in any media, altered, reproduced, hosted on another server, used in SIM GAMES, or used in any manner other than displayed up on our website. Hot linking to our files is bandwidth theft and appropriate legal action will be taken against offenders.